Mapping your local “food web” – the connections between producers, retailers and consumers – highlights its importance for your local economy, landscape and community. This toolkit (downloadable from the website) provides all the materials and guidance you will need for a successful project. May’s Monthly Gathering was packed last night as we explored and celebrated the future of small farming with the exquisite film In Our Hands. Thanks for coming, thanks for bringing energy and ideas to the room and for your ‘what next’ thoughts. Thanks also to The Bookshop for hosting and for Holland for her fantastic food, all from local producers. 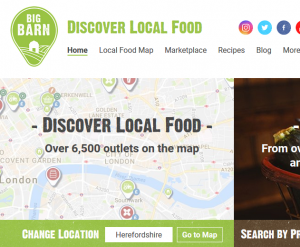 Mentioned last night was Big Barn – it’s a perfect resource to find local food producers and outlets but it could definitely do with more info about our area! If you’re a producer – please add yourself – and encourage other outlets to mention you if they sell your stock! If you know a great producer who’s not on there – get them to add themselves! It does have a cost – £40 a year but with more Herefordshire producers, we the network can embed this in our site and encourage others to do the same. If you are a small producer but sell at the Farmer’s Market – they can mention you there. Let’s fill that map with our amazing producers. Next local opportunity will be Saturday July 14th at Leominster Community Centre. Email beth@greenschoolsproject.org.uk if you’d like to supply produce, or help make it happen. It would also be great to have a good Green Network presence there so email events@hgnetwork.org if you’d like to volunteer. Tell our decision makers – the benefits of small farms ahead of the discussion on a new bill in the Autumn. Email events@hgnetwork.org to be part of group action around this. Thanks again for coming – see you at June’s gathering (20th June) where we will be checking in with the Plastics Action Here team, the Divest Parliament team and we’ll have a workshop on Sociocracy too. Food Rescue – what next.. Along with the Herefordshire Food Poverty Alliance we are starting an exciting conversation about developing some funded local projects. Many of you had projects that you were beginning to set up or talked about that evening: a local community fridge, a local food hub, food social clubs, school holiday food clubs, local gleaning projects and also of course a local Food Rescue inspired by the work of Worcester Food Rescue. If you have bright ideas and local connections or would just like to be part of taking these conversions further please could you get in touch asap (email kate@hgnetwork.org), so that we can make sure that your project idea is firmly in the pot as funding bids are developed. 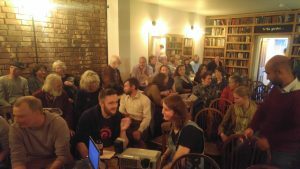 On Wednesday 17th January in the dark atmospheric basement of the Left Bank Speakeasy around 25 people came together to shed light on local food waste, with the aim of developing some local grass root community responses. Tony Kennall and Patrick Vansloun of the Worcester Food Rescue project described their impressively organised approach to their city food waste. They took us step by step from their initial discussions with supermarkets through to coping with Christmas 2017 – and the huge volume of surplus food they have been able to keep out of landfill and re-distribute to communities over this period … and the mountain of landfill food waste that is still beyond them. Jacqui Allsop of Hereford Food Bank brought us up to date with the situation in Hereford city. The Food Bank provides emergency food to those who have been referred to the service. Hereford Food Bank has only very limited capacity to store donated food, and has to carefully manage the logistics of collection and re-distribution of food, and the constantly increasing referrals from local agencies. Jacqui also described hot food provision in the city – which is available daily to anyone who needs it. Peter Norton of Brightspace Foundation then focused on the issues of hunger and food insecurity. A recent Oxfam report showed that more than 500,000 people in the UK are now dependent on food parcels… a shocking figure in the 7th most wealthy nation in the world. In Herefordshire more than 2000 people accessed the food bank last year, and as Jacqui described this figure only includes those in crisis and referred into the service. 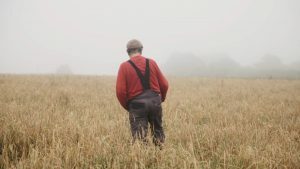 Countless others are invisible to the statisticians – and it is partly in response to those in need but not receiving help that Pete is developing a Food Poverty Alliance for Herefordshire. The presentations left us all thinking, and after some discussion and mindmapping of ideas the group highlighted some possible areas of interest & action to take forward. We particularly focused on the problems of rural isolation and the cost of local public transport, and the need for support to be made more available within our rural communities. Community Fridge. This might be based at a central location but with local outlets in the villages around Herefordshire. Food Social Clubs – making use of existing local centres such as churches and community centres and combining food collection (either direct from Supermarkets following the Food Rescue approach or from a central Community Fridge) and distribution that would be available for all. This could be supported by local social activities such as cooking, preserving, shared music and gleaning. Gleaning – using surplus food direct from growers. People suggested that we might explore working with local growers such as Arkstone Mill or Canon Frome Court, and explore options around juicing fruit to ensure it can be stored and used. For more information there are links below to Worcester Gleaning group and West Country Gleaners. School Holiday Food Clubs. Peter described statistics that show 3 million children currently go hungry during school holidays, and activities around schools as food distribution and provision centres are increasingly important. Holiday projects based in our local schools could include food growing and cooking alongside other activities. Funding would be needed to cover the cost of heating and cooking, and projects might need to borrow community centre kitchens. Saxon Hall in Hereford already offers a holiday club on this basis. Legislation. It was broadly agreed that tackling the root problems of surplus is paramount, with people suggesting that supermarkets should be fined for overstocking. Changing the law on ‘best before’ dates should also be considered. We will return to food insecurity as an issue at our HGN Gathering on the 16th May 2018. If in the meantime anyone would like to start to explore ways of developing one of these ideas – or other ideas, such as the city Food Rescue project – please get in touch and HGN will support you. More information is given via the links below. Worcester Food Rescue, and an article about the project here. OUR FIRST HGN GATHERING OF THE NEW SEASON! Wednesday 17th January 7.30pm at De Koffie Pot, Left Bank, Hereford, all welcome. Global news in January is often difficult to stomach. 2017 is now officially the hottest year on record and forecasters are predicting increasingly arid landscapes around the world. Here in the Herefordshire in the winter grey, mud and rain that seems hard to imagine – but what we are confronted with is record levels of use at UK food banks, and 19% of households in Herefordshire now officially defined as living in poverty. In a food-producing county no one should go hungry, and at our first Herefordshire Green Network Gathering of the New Year we invite you all to join a discussion about local food waste and food poverty. Speakers include Tony Kennall from Worcester Food Rescue, an innovative local project that is dedicated to diverting end of shelf-life food from landfill to charitable organisations, plus Peter Norton of the Herefordshire’s Brightspace Foundation who is currently working with local organisations to develop a new food poverty alliance and strategy for the county, and he will share details of that project with us. We will also be joined by Jacquie Alsop, coordinator of Hereford Food Bank. Bring along your questions and your ideas. Our aim is to gain some understanding of this issue, and explore our options for making a positive local change. On Thursday September 7th from 4.30pm – 6.30pm join local people in celebrating a year of the Golden Valley Food Assembly, with music, games, crafts and even more fantastic local food.